Japan’s Kazufumi Ose really loves the 9 Dragons and he proved it in the best possible way by fighting tooth and nail to beat France’s Julien Chorier and take the overall victory. After losing nearly 9 minutes to Chorier on the 50 miles on Saturday, Ose attacked halfway through Sunday’s 50k race and reached the finish line with an advantage of 12 minutes. Magdalena Boulot lived up to her status as pre-race favourite and won the women’s 50/50, although local runner Jcy Ho gave her some stress during the 50 miles race. The 9 Dragons Ultra, with its quite unique 50/50 format, has grown into a showcase ultra trail event for Hong Kong and a genuine test for even the international elite runners who traveled to take part in it. Running conditions were generally smooth, although perhaps more warm and humid than usual this time of year, particularly on Sunday. The two courses are in a sense typical Hong Kong with a very high dose of stairs and steps. That’s not everyone’s cup of tea, as one Ruth Theresia found out. The Indonesian ATM Champion was never in her element and struggled her way to the finish on both days, well down the leaderboards. Still, it was another example of her determination to finish what she starts and learn from the experience.. Many elites, such as UTMB winner Francesca Canepa, threw in the towel quite early. Julien Chorier was one international star who did have the knife between his teeth and go full gas for the win. Kazufumi Ose, winner of the 50 miles race in 2017 and second behind John Ellis on the 50/50 last season, pushed him forward all day on Saturday. Sabah’s Milton Amat, a typical fast starter, tried to keep up in third place. Amat, who had been unable to fight for the ATM Championship at the end of last year due to a malaria attack, was clearly back at his best level. His experience of doing the 9 Dragons in 2018 - 4th on 50/50 - of course helped him to prevent a meltdown, even though local hero John Ellis did catch up with him in the later stages of Saturday’s 50 miles. The Hong Kong-based Australian struggled all weekend with a calf injury sustained a week ago. His grit brought him a well-earned third place, which he then defended successfully on Sunday’s 50k against Amat, Hisashi Kitamura and Salomon Wettstein. Ellis has ATM Championship ambitions this season, yet may need some recovery time first. Kitamura, 4th in the ATM Championship 2018, celebrated one year of ultra trail running by improving from 19th to 5th on the 50/50! On Sunday he was one of the fastest finishers by catching Milton Amat at the end and putting enough distance between him and Wettstein, who had beaten him a day earlier. Hisashi Kitamura caught Milton Amat just before the finish and grabbed 5th place overall in doing so! Jcy Ho was surprisingly strong on the 50 miles, running virtually together with top favourite Magdalena Boulot until CP4. There, just before sunrise, the Hong Kong runner took (too much?) time and lost sight of the American for good. Boulot was in charge from then on, including on Sunday where she was unchallenged by other 50/50 athletes. Jcy Ho held on to second place, and in third on both days came Malaysia’s Christine Loh. Nicknamed ‘the Pocket Rocket’ by some, Christine Loh is the 2017 winner of Penang Eco 100 miles and a runner with ATM championship ambitions this season. Including last weekend’s 9 Dragons, she also has all four ultra trail points races in Thailand on her agenda. Chengdu-based American Justin Andrews dominated the 50 miles single stage on Saturday. An upset stomach threatened to spoil the party for him, but he fought his way to the finish. Philippines’ Koi Grey ran a smart race. Contrary to his usual style, he started out conservatively and then began to move up the leaderboard until he had second place in sight. Twisting his ankle at km 71 ruined his chances. Kurt Evans, Ander Iza Rekakoetxea and Takefumi Yamamoto preceeded him at the finish. The women’s 50 miles was won by Edith Fung, who beat Fredlyn Alberto from Philippines by over an hour. The podium was completed by Mokwan Chan. The single stage 50k was not a points race for the ATM Championship, but saw some excellent runs by regional top performers. Deng Guomin from Shenzhen beat the course record to win the 50k in 6:09:21 ahead of Yuta Suda and Blake Turner. In the women’s Charlotte Tacquet was strongest in a fantastic battle between several women, including Sandi Menchi - strongest finisher - and 2017 ATM Champion Kim Matthews, who returned to the ultra scene after more than a year of hip injury problems that at one point even threatened her competitive running ‘career’. Koi Grey continued his comeback and almost scored 2nd place on the 50 miles. The 9 Dragons Ultra in Hong Kong is the first SuperTrail of the 2019 Asia Trail Master Championship taking place across the New Territories this weekend. The 50/50 stage race and 50 miles (in actual fact 89 km this year) are both A-races, which means a lot of ATM points are up for grabs. But this being a SuperTrail, and in Hong Kong, the competition is dense. The 9 Dragons traditionally attracts international trail running stars and this season is no different with the likes of Francesca Canepa (women’s UTMB winner 2018), Magdalena Boulet and Julien Chorier. However, just how motivated are they for suffering in this gruelling stage race in Hong Kong? Because even if they say to ‘just want to enjoy’ or ‘it’s just another race’, the 9 Dragons stage race is considered the toughest ultra in the territory and the hyped-up local and regional challengers are for real! Saturday’s 50 miles has an elevation gain of over 5000 hm, and the 50k has a whopping 3500 hm. A lot of stairs, obviously, are included. To begin with, the top 2 from last year is back: Hong Kong-based Australian John Ellis and Japan’s Kazufume Ose. From an ATM perspective, John Ellis will be one to watch in particular as he has announced to give our championship a shot this season. This “winter” in Hong Kong, not everything has been going to his liking and he seems to have become more injury-prone, but Ellis’ stamina and determination is the stuff of legends and it would be unwise to bet against him this weekend - at least for a podium finish on the 50/50. Ellis has been planning to travel to several races in the ATM Championship this year, which remains unusual for a top star in Hong Kong. A local challenger for the victory at the 9 Dragons will certainly be Law Chor Kin. This Hong Kong ultra specialist won the Penang Eco 100 miles a year ago in very impressive style indeed. Ben Duffus, Jacky Leung and Jeremy Ritcey are local podium candidates as well. We will be very interested to see the progress of Hisashi Kitamura from Japan, now based in Kuala Lumpur, and fourth in the 2018 ATM Championship. Kitamura - a newbie in trail running - just kept on getting better last year, let’s see how he starts his 2019 campaign. There’s also quite a crowd from the Philippines in the men’s races. Carlo Chiong came to the fore of the ATM scene at the end of 2018 with a third place in CM 50 and a second spot in Fifty Mapawa. Especially the latter was interesting, as he was over an hour faster than Japan’s Tomohiro Mizukoshi. Carlo Chiong is certainly a dark horse this weekend. And so is Malaysia’s Milton Amat. The sympathetic Sabahan ended 4th in the 9 Dragons Ultra last year and returns to get on the podium - also because he likes to have a shot at the ATM title this year. Amat, who began competitive trail running only in 2017, ended last year as seventh in the ATM Championship and - importantly - won the Bandung Ultra 100: a very technical race in Indonesia in which he distanced local hero Arief Wismoyono and Spain’s Salva Rambla. With the experience from last year in the bag, Milton Amat can cause the upset in Hong Kong this weekend. One caveat: has his body recovered well enough from a malaria attack three months ago. Another 2018 ATM top 10 performer, Michael McLean from Canada - but based in Brunei - is opening his new season here this weekend. McLean is a proper ultra runner, remember Borneo TMBT Ultra last season in which he caught six guys in the final 10 km! He should find 9 Dragons to his liking, although he can also have bad days (e.g. DNF in Ultra Trail Chiang Rai 230 in October). India’s Shashwat Rao is another runner who kicks on the type of challenge 9D poses. His performance kept improving during the 2018 season, let’s see where he is at the beginning of 2019. Singapore-based Vietnamese Trung Nguyen was 2nd in the Vietnam Jungle Marathon 70 and 4th in the Vietnam Mountain Marathon 100 last season: another one to watch out for. In the women’s, the obvious favourite is Italy’s Canepa and it will be interesting to see how our own 2018 ATM Champion Ruth Theresia fares against her. Theresia is looking forward to her first big race of the new ATM season, yet emphasises that everything is currently based on doing well in France come late August. Other regular ATM competitors will challenge her this weekend. For instance, Carrie Jane Stander, winner of Ijen Trail 70 last September, and also Christine Loh from Malaysia. She won Penang Eco 100 miles ahead of Ruth Theresia in 2017 and has a focus on the ATM Championship this season with, amongst others, all Thailand points races on her programme. On the single stage 50 miles race this Saturday, we will see several established ATM runners in action. 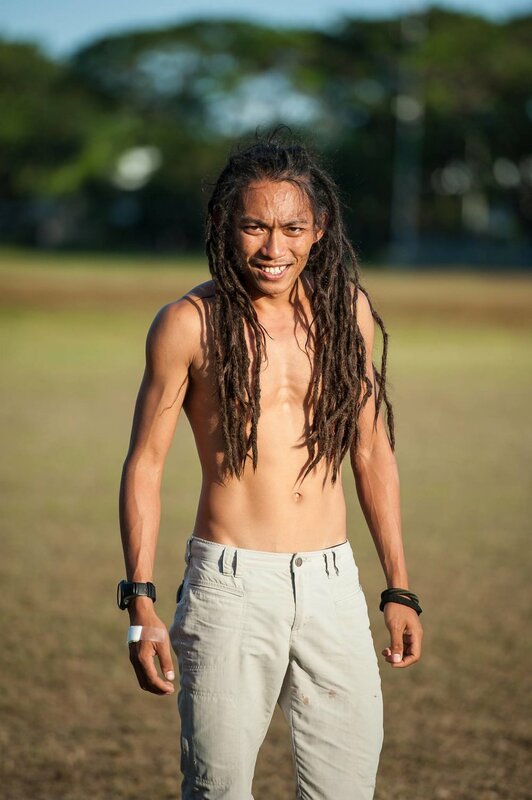 From Philippines we have Mark Koi Grey, who has relaunched his running career recently, Thumbie Remigio and Patricia Ann Morota (female). Spain’s Ander Iza Rekakoetxea will also be right up there, as will Dutchman Peter van der Zon. We will be reporting from the 9 Dragons throughout the weekend via our facebook and instagram channels. “Is This Fun?” | 9 Dragons from Robin Lee on Vimeo. After two intense days of racing in the New Territories of Hong Kong, John Ellis and Corinne Williams crowned themselves as the so-called 9th Dragons yesterday. Both won one of the two stages - Ellis the 50 miles and Williams the 50k - but probably had to fight harder to score a win than ever before in their trail running careers. Australia's John Ellis from the Gone Running team always keeps everyone in suspense as he is a notoriously slow starter, but this time he had to dig deep to handle the Japanese duo of Kazafumi Ose and Kaito Kobayashi. 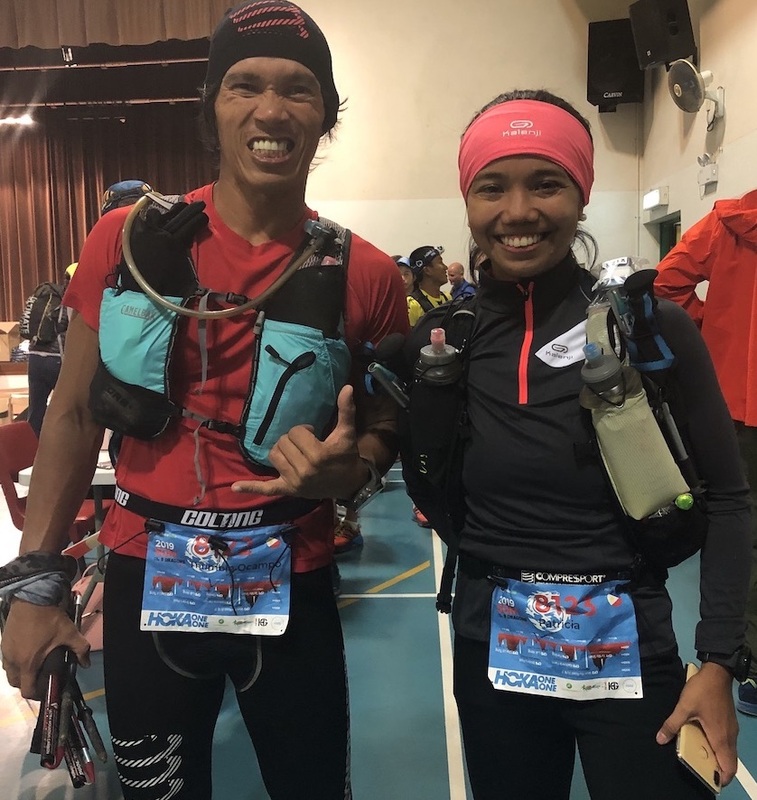 In yesterday's 50k, the Japanese runners seemed to have recovered better than Ellis from the tough 50 miles the day before and took the fight to him, aided also initially by the strong Malaysian Milton Amat. On Saturday, Kazafumi Ose was leading the race until Ellis caught him with just 20K to go, and yesterday Ose and especially Kobayashi -third on Saturday but significantly behind on time - had that little extra left in the tank. John Ellis needed to protect a time advantage of 20 minutes on Ose, and he did just that albeit settling for third place in the 50k race. Kobayashi won it ahead of Ose. Milton Amat was fourth on both days, and showed that his joint victory in Borneo TMBT Ultra last year was no accident. Britain's Tom Robertshaw is still recovering from injury, and in that respect had a promising result with 6th place, just two minutes behind Jeremy Ritcey in the overall. The women's 50/50 race was arguably even more exciting than the men's and also featured a leading trio who battled each other relentlessly on this very tough and technical race weekend. Australia’s Kellie Emmerson looked like the fastest woman in the first half of the 50 miles on Saturday, until Okinawa-based Corinne Williams and local French woman Elisa Jean De Dieu turned on their engines and began to catch up. Williams was first and wasted no time to put Emmerson under pressure. However, it was Elisa Jean De Dieu from Team Uglow who suddenly became the quickest woman on the course as she bridged the gap to Williams and even took a small lead. Williams, third at Izu Trail Journey last December, rallied hard but struggled for grip with a completely destroyed shoe sole. In a descent in the final section of the race, Elisa Jean De Dieu opened the decisive gap and took a very big race victory. Williams was able to limit the damage to 2’38”, while Emmerson dropped back signifcantly in third place. Sunday’s 50K was bound to be a thriller, and yet again, Emmerson and Williams were quicker “out of the blocks” than Elisa Jean De Dieu. The duo was helped by 50K single stage protagonist Sandi Menchi, who set a quick pace in her own determination to win that race category. Elisa Jean De Dieu was again just a few minutes behind. Contrary to Saturday, however, she was unable to get to the front. In the final section of the race, she felt the accumulation of efforts more than the others and would settle for third place in the race, losing over 1 hour to stage and overall winner Corinne Williams. It should be mentioned that Chris Yee Ting Kwan from Hong Kong delivered a great performance in the shadow of the big three, by finishing fourth in an overall time of less than 23 hours, only 17 minutes more than Kellie Emmerson. Corinne Williams joins Ruth Theresia at the top of the ATM Championship ranking with 550 points. The 9 Dragons was a SuperTrail race, as was UTKC last week and as is Cordillera Mountain Ultra next weekend. In the men's championship, John Ellis joins Jay jantaraboon in third place behind Arief Wismoyono and Dean Perez, who both already ran two points races this season. The 50 miles single stage category was another battleground last Saturday. In this one, Thailand-based Briton Harry Jones opened his ATM account with a great but hard-fought win over China’s Deng Guomin and Austria’s Michael Skobierski. Deng Guomin, from Shenzhen, proved to be the strongest climber of the trio, yet missed a marker, went off-trail and saw his advantage disappear like snow under the sun. Jones and Skobierski caught up and would not give him a second chance in the final 20K of the race. Jones attacked at the start of the final section and managed to pull away from a resilient Deng Guomin, while Skobierski settled for third. Jones finished in 10:41:22, 1’40” ahead of the Chinese runner. Harry Jones is on the start list of Cordillera Mountain Ultra next week, and hopes to be recovered for that by then. Itsuko Uemiya was the fastest woman in this category, which was the B-race and therefore still valid for points in the ATM championship. The 50K category was not valid for points. The 9 Dragons proved again to be one of the hardest trail races in Hong Kong, if not the hardest. Current unofficial (!) finish rates are pending but are likely to be well below 50%. Not only are the two race courses as tough as they get in this part of Asia, but the CUTs are tight as well. To ease the pain, the organisation made sure all refreshment stations are appropriately stocked. Elsa Jean De Dieu and Corinna Williams put up a fantastic show in the women's 50/50!